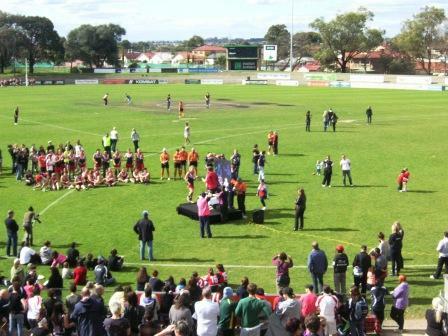 Coburg City Oval hosted the grand finals of the Victorian Women’s Football League on Saturday 27 August 2011. Both the reserves and seniors were between the Darebin Falcons (who won the reserves by four goals) and the VU St Albans Spurs (who won the seniors by 13 goals, stopping the Falcons’ run towards a sixth consecutive premiership). 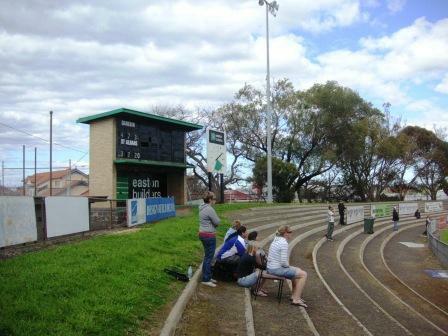 City Oval is the home ground of VFL team the Coburg Tigers (known simply as Coburg, or the Lions, in their VFA days.) 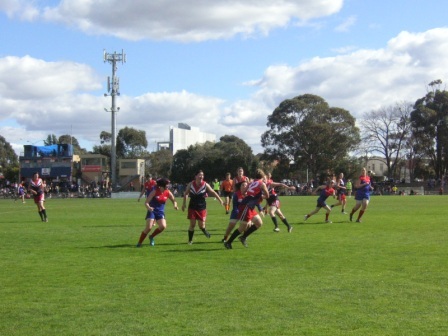 The ground also hosts TAC Cup games for the Calder Cannons and finals of local leagues such as the Essendon District Football League. There are about 50 black-and-white team names stacked in a corner of the scoreboard. Some are painted, some are double-sided, some are black tape on white plastic. 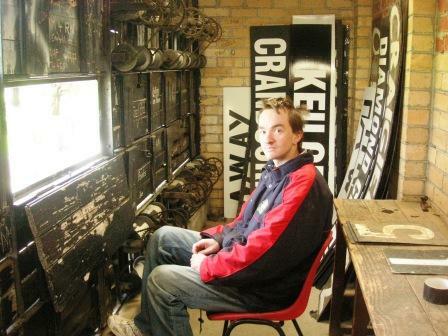 Overseing all the games from the cream-brick scoreboard on a distant flank of the ground is Kyle Walsh, who answered an advertisement in the local paper ten years ago. “I was the first person to leave a message on the phone, so I got the job,” said Kyle. He suggested that his predecessor was perhaps a bit too enthusiastic in his barracking, particularly when commenting on umpires’ decisions. Kyle’s previous scoreboard experience was as an eight year old when his Dad was playing for the ANZ Bank team. 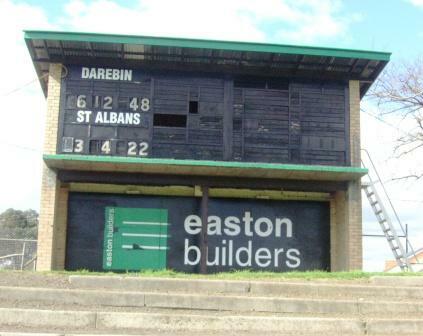 The current scoreboard at Coburg was apparently built in 1965, when North Melbourne played a season there. It’s a solid structure and won’t be falling down in a hurry. 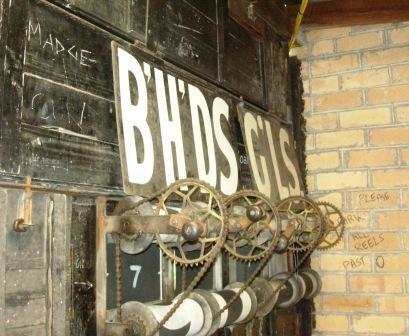 It still has bike-chain pulleys to roll over the numbers and boards, numbers and letters (no longer used) for around the grounds scores and race results. 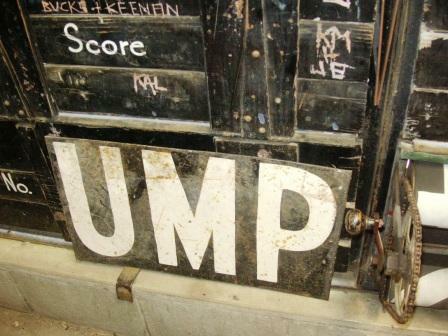 The previous scoreboard was behind the goals at the southern or Munro St end of the ground. “It’s long gone,” said Kyle, keeping his eye on the women’s grand final. Kyle’s first game ten years ago was between the home team and the Essendon reserves, with Coburg winning a close game. He also does Coburg’s games at Highgate Recreation Reserve, a new ground further north in Craigieburn. 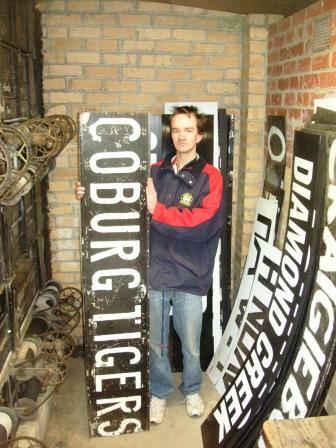 Kyle is just as happy with the electronic scoreboard at Highgate as he is with the old rollers at Coburg. Kyle’s a North Melbourne supporter but rarely gets to go to a game due to his scoreboard responsibilities. After the two women’s grand finals on Saturday at Coburg he had three EDFL games to do at Highgate on the Sunday. Grand Final score in the VWFL reserves match between the Darebin Falcons and the VU St Albans Spurs. The senior game was won easily by the Spurs. The old Coburg City Oval scoreboard is no more. The new electronic scoreboard had its first game last weekend, Coburg going down to Collingwood. We thought the new electronic ‘board would update faster than the old rolling score … but it still took up to thirty seconds to show the new score. Thanks Paul. One by one they come tumbling down. Hopefully somebody salvaged a few names plates and rolling numbers. Cheers.